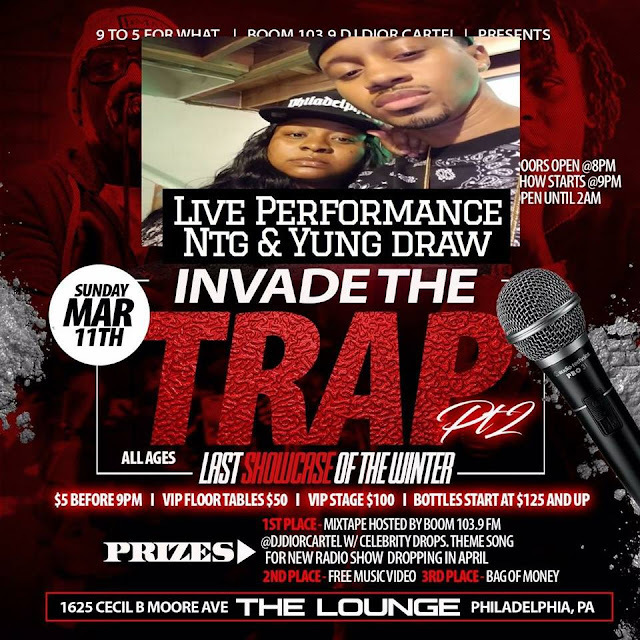 Check out Philly's Power Couple "NTG & YUNG DRAW" Performing live at 103.9's own Dj Dior's event "Invade The Trap Part 2". Ntg & Yung Draw have been featured in Hip Hop Weekly & XXL magazines in addition to being featured on popular sites like Hip Hop Dx, Hip Hop Vibe & Hip Hop Since 1987. Philly's Power Couple have performed with legends like Kurtis blow and collaborated with Philly native Tone Trump. Come see what all the fuss is about live !!! 3/11/18 at "THE LOUNGE" 1625 Cecil B Moore Ave Phila,PA.